So long as the free debt party raged on, news didn’t really matter. Good news, bad news, no news…BUY. When even the weakest companies could zombie along perpetually tapping the ZIRP mine and additional stock buyback funds were always available on emergency stimulus terms…don’t think, don’t analyze, don’t question why…just BUY. Watching this runaway, debt-fueled colossus be brought to a screeching halt after screaming along at 200MPH on Fed-greased rails is going to be staggering to see. Corporate America will beget the next wave of financial pain, or even recession, a growing choir of the world’s biggest money managers is warning. After years of borrowing for stock buybacks and company buyouts at extremely cheap rates, the tide is turning as the Federal Reserve raises its target rate and pulls stimulus. That’ll pressure the swollen ranks of over-leveraged firms and weigh on growth, Guggenheim Partners Global Chief Investment Officer Scott Minerd said. Pacific Investment Management Co. and BlackRock Inc. are among investors curbing purchases or being pickier about what they buy. 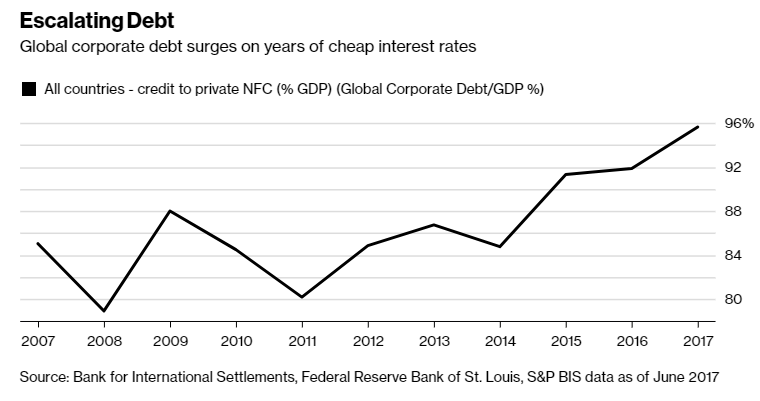 Debt levels crept up as central banks suppressed borrowing benchmarks, with the proportion of global highly-leveraged companies -- those with a debt-to-earnings ratio at five times or greater -- hitting 37 percent in 2017 compared with 32 percent in 2007, according to S&P Global Ratings. When that burden collides with rising rates, it could cause a recession in the “late 2019 to mid 2020” window, Minerd wrote.